Let Us Be Your Neighborhood Dentist! Why don't dogs get cavities very often? Adult dogs have 42 permanent teeth compared to humans who only have 32. Dogs hardly get cavities because of a higher pH level in their saliva. Toothbrush looking a little frayed? Schedule an appointment to find out more. and receive your special gift! Like everything else in life...teeth whitening is also good in moderation. The not-so-bright side of the teeth whitening industry is that patients continue to turn to online resources to whiten their teeth, simply due to cost. This can be dangerous to their overall oral health, as inexperienced persons will expose their teeth longer than recommended to the whitening solutions or improperly fit the whitening tray to their teeth. We believe prevention is the best medicine. 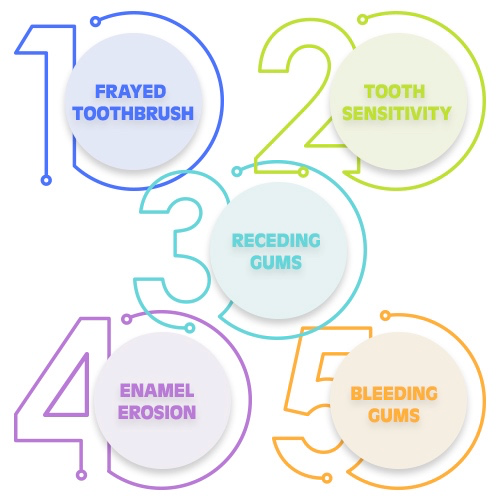 Regular cleanings and examinations are the best way to curb dental problems before they arise. A professional cleaning or "prophy" leaves your gums healthier and your teeth whiter. Even if you haven’t had a cleaning in years, it’s never too late to treat your mouth. Your x-rays and examination will determine the type of cleaning you need. If you have periodontal disease a “prophy” is not enough for you. You will need a periodontal cleaning and maintenance program instead. * We are open one Saturday per month.